Figure out what path Kinley took as she crawled around the room! Kinley's Krawl is a puzzle of logic. It provides 15,000 puzzles in each of many sizes (the above is a small size 2 puzzle in its unsolved and solved states, the first two images above). 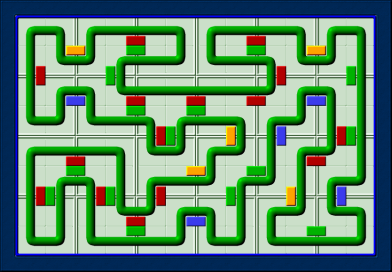 The goal of each puzzle is to determine where Kinley crawled, making a complete loop. She never crosses her own path, and yet managers to cross every single sub-tile on the floor! Each tile in the puzzle represents a floor tile, each made up of four sub-tiles, so Kinley crawls across all four 'corners' of every tile. She always crawls in a clockwise direction around the loop. 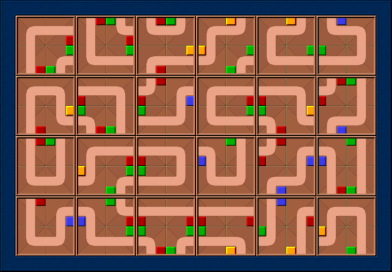 Different image sets almost completely change the nature of the game, some show colored links between the tiles, some show different colors for the inside and outside of the loop (the third image above), some show the direction of Kinley's crawl along the path. 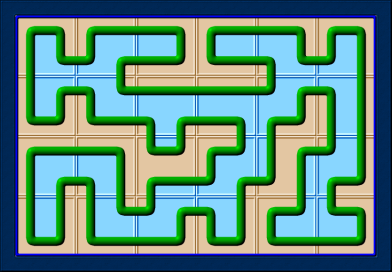 Puzzle sizes are from 4x4 tile up to 16x12 tiles.